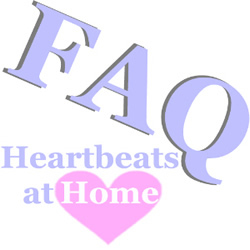 Is the Heartbeats At Home fetal doppler safe to use? What if I am having trouble finding the heartbeat? How long does it take to receive the doppler once I place my order? Is there a minimum amount of time required on the rental? What is your return policy on other products? Do I need special lotion or gel? What if the light on the Heartbeats At Home Doppler is red? Can I record and e-mail the heartbeats? Do you have a “Rent to Own” program for your dopplers?